Today (August 20) humanity’s use of renewable natural resources has already “overshot” the amount the planet can produce in one year, say environmental NGOs. Humanity is currently using 1.5 times its global capacity for resource regeneration, think tank Global Footprint Network says. But Europe blazes through 2.66 its capacity to sustain itself, and the figure is even larger for the United States, at 4.16. 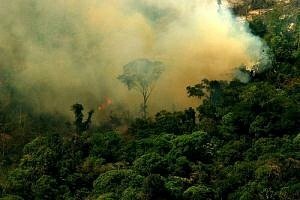 But some regions, including sub-Saharan Africa, are using less than their land can reproduce, raising the worrying prospect of ever-shrinking forests, fish stocks, increased land degradation and biodiversity depletion as developing countries increase their resource use. Major economies, such as the European Union, also export much of their ecological footprint. Between 1990 and 2008, tropical forest three times the size of Belgium was cleared for growing agricultural produce destined for the EU, the WWF says. "We are effectively using our share of our resources and those of other countries too,” Long said. The data, called the “Ecological Footprint”, also factors in the use of fossil fuels, while not considered “renewable” in practical terms. “Fossil fuels are factored in through the carbon allowance”, said Philippe Carr, a spokesman for WWF. The earth has an upper limit to the amount of carbon dioxide it can absorb in one calendar year. Carr added that fossil fuels could be removed from the yearly resource “balance sheet” because they are a finite resource. Oil and gas, while vital to all modern economies, take millions of years to produce from dead plant and animal material squeezed under enormous pressure between layers of the earth’s crust. More than 50% of the Ecological Footprint is composed of the carbon footprint, especially from the burning of fossil fuels, says the WWF. British think tank New Economics Foundation originally developed “Earth Overshoot Day” to draw attention to human habits of over-consumption. Humanity first fell into yearly “ecological debt” in the 1970s and the date has been drawing forward steadily since. Global Footprint Network, a partner of the think tank and the WWF, has taken over the campaign yearly since 2003. The European Commission has urged for a more resource efficient EU economy, publishing in September 2011 a Roadmap to a Resource Efficient Europe. This calls for the introduction of indicators and targets across the now 28-member bloc. But as yet no binding laws govern resource efficiency at the EU level. The European Commission unveiled its Roadmap to a Resource Efficient Europe in September 2011, recommending the introduction of resource-efficiency indicators and targets across the 27-nation bloc. The roadmap followed the adoption of a first policy paper in January, which established resource efficiency as the guiding principle behind EU policies in almost all sectors – energy, transport, commodities, industry, agriculture, fisheries, biodiversity and regional development. I am long time active ecologist, work in that area and behave as such in principle. However, not so sure if all the NGOs and other self nominated “saver of the world” people who think they are important and their mind has to rule the world know waht they do and write and say. Even very famous “Club of Rome” had to adjust previous statements quite sharply. Yes, a few NGOs in potential opposition with governmental policies are good. But these groups are shooting like champions out of the ground and sometimes it appears almost this is a good way of generating a good income and to impose a certain politics. Who is behind all this and giving the money ? ?